Sugarcane juice or Ganne ka ras is one of the delicious and healthiest Indian drinks. It is available at a cheap price and hence everybody can consume it to avail its benefits. Ganna crop is found across India which belongs to the grass family. You can chew the pieces of sugarcane or also consume its juice which is prepared by crushing the peeled sugarcane between the machines. To enhance the therapeutic effect, lemon, mint, ginger and black salt is added to sugarcane juice. Sugarcane juice is alkaline as it contains high concentration of magnesium, calcium, potassium, manganese and iron. It helps to prevent cancer as the cancer generating free radicals cannot proliferate in an alkaline environment. Due to the high potassium content, Sugarcane juice is beneficial to maintain a healthy digestive system. It also curbs stomach infections and is considered useful in treating the constipation. Sugarcane juice keeps heart ailments and stroke at bay by reducing the levels of bad triglycerides and cholesterol. Sugarcane contains soluble fibres and natural sugars which assist in shedding the extra weight. Sugarcane contains high amount of natural sweeteners that have a low gylcemic index (GI). Hence, it is a beneficial drink for diabetics. Alpha Hydroxy Acids are the natural constituents of Sugarcane which fight against acne, pigmentation, blemishes, and early ageing. It also keeps the skin hydrated. Apply few drops of sugarcane juice on the face and let it dry to get a radiant, glowing and clean skin. 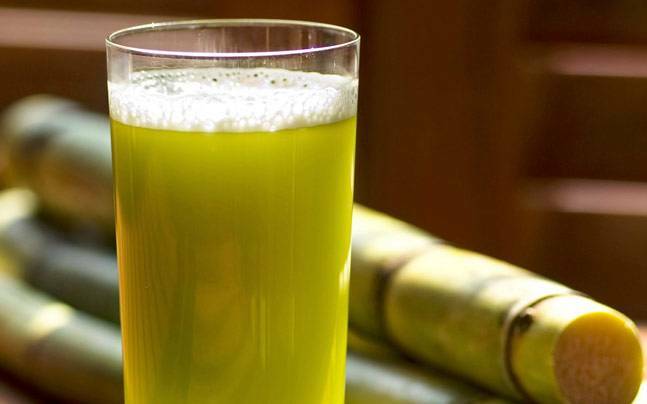 Sugarcane juice is an ideal remedy for treating jaundice, fever, and sore throat. Previous articleHow Many Calories Are There in Aam Panna & Does It Have Any Health Benefits? Next articleWhy You Must Stop Drinking Alcohol? How Many Calories Are There in Kokam Sharbat & Does It Have Any Health Benefits?